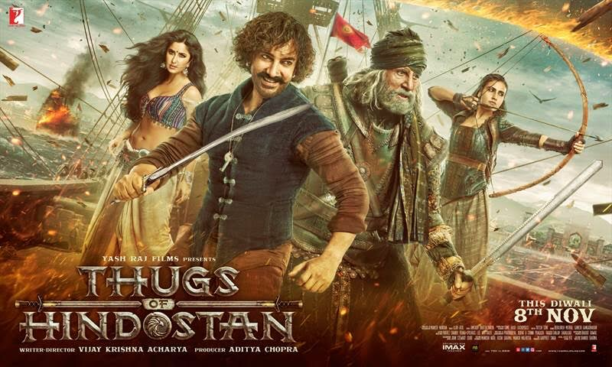 Yash Raj Films Diwali extravaganza “Thugs of Hindostan” promises jaw dropping action, visual extravaganza and a larger than life cinematic experience. The enormousness of the visual spectacle deserved a massive trailer launch that justifies the scale of the film. Thugs of Hindostan trailer, thus was launched on 27th September, Mr. Yash Chopra’s 86th Birthday Anniversary. The trailer was launched at the biggest IMAX screen of the country, Carnival Cinemas, IMAX Screen, Wadala, Mumbai. Amitabh Bachchan the tough strong sword-fighter versus Aamir Khan in one of his most intriguing characters yet! We could say more but you just need to experience this for yourself! Check out the Thugs to get even more excited about this epic film! Thugs of Hindostan is one of Indian cinema’s biggest films which releases in theatres worldwide this Diwali. YRF has pulled off an incredible casting coup by bringing together two of the biggest legends of Indian cinema, Amitabh Bachchan and Aamir Khan on screen for the first time. Directed by Vijay Krishna Acharya, The film also stars Katrina Kaif and Fatima Sana Shaikh. YRF’s mega action adventure, Thugs of Hindostan, is set to release on November 8, 2018! We seriously can’t wait! 16 queries in 0.513 seconds.